I am back with a card that I made for the Jane’s Doodles blog last week. And did you catch the VERY exciting news for Jane’s Doodles fans? I won’t spoil it – head here for my card and the announcement. Today’s card was inspired by an advertisement I saw flipping through some junk mail recently. Inspiration is all around us. 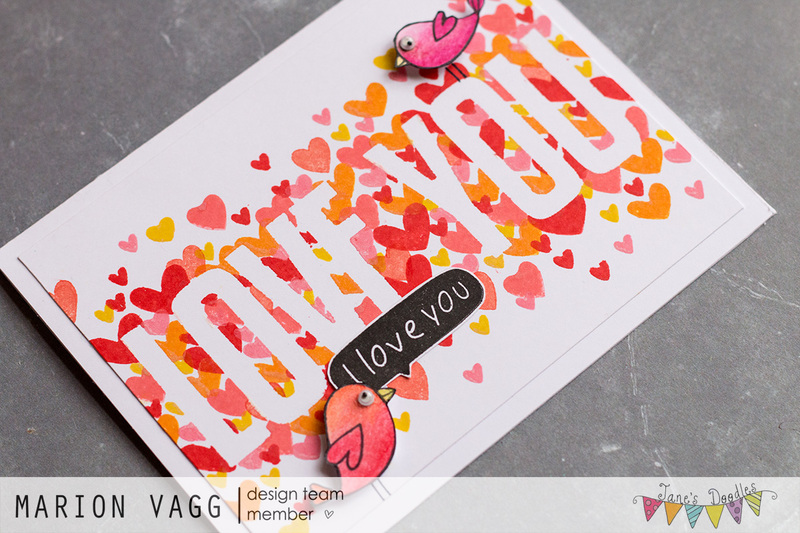 Firstly, I die cut the large Love You letters (MFT dies) from masking paper and positioned them on the card (this was the most time consuming part of making the card – lining them up to be straight!). I then grabbed some hearts from various Jane’s Doodles sets (Monster Squad, Dogs and Love Birds) and got stamping around the letters using Distress Oxide inks (and one Memento Luxe ink). It was fun to peel away the masked letters to reveal the stamping. 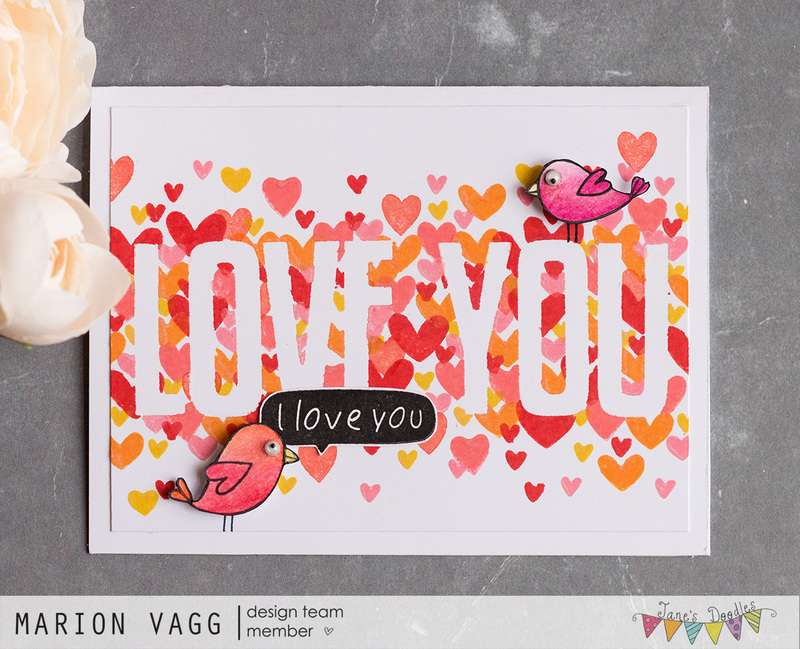 All that was left to do was stamp and colour the birds from the Love birds set and the sentiment and add them to my card. I just love how it turned out – especially after adding those googly eyes! Thanks for stopping by today. I am enjoying my summer holidays and have a few more weeks left until school starts again. I love holidays! It is with sadness that we say goodbye to the Tag You’re It challenge that has been faithfully maintained by Tracey McNeely. I was on the original Design Team for this challenge so it will always hold a special place in my heart. As part of the farewell, I was asked to choose my favourite tag that I had made for the challenge. My favourite tag is actually one that I made last year when I was asked to be a Guest Designer. To view the original post go here. Thank you Tracey for all your hard work with keeping this challenge up and running. It has certainly been appreciated by many and this challenge will be missed. Other Supplies: Hero Arts white embossing powder, Heat tool, Anti static pillow, Texture Paste, Kaisercraft stencil – Clock Template, Palette knife, Die-Namics die – Upsy Daisies, Fancy That die – Leafy Swirl, Penny Black die – Tagged, Cuttlebug, Twine, Large Clear gem, Liquid adhesive, Patterned paper (Brand unknown for the flower), Foam dimensionals. 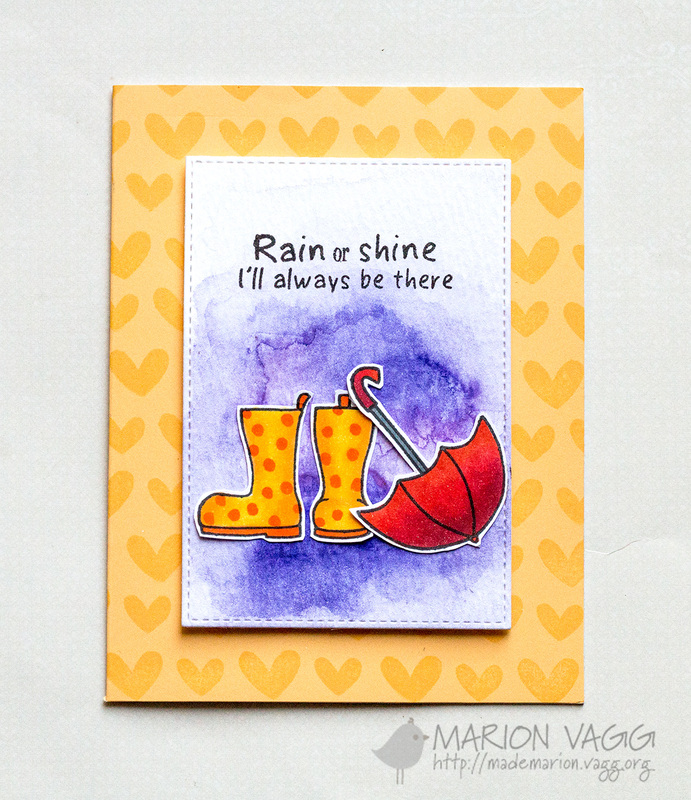 I have a card over on the Jane’s Doodle blog today. This card took a very direction to what I intended, but sometimes you just have to roll with it and see where creativity leads you. 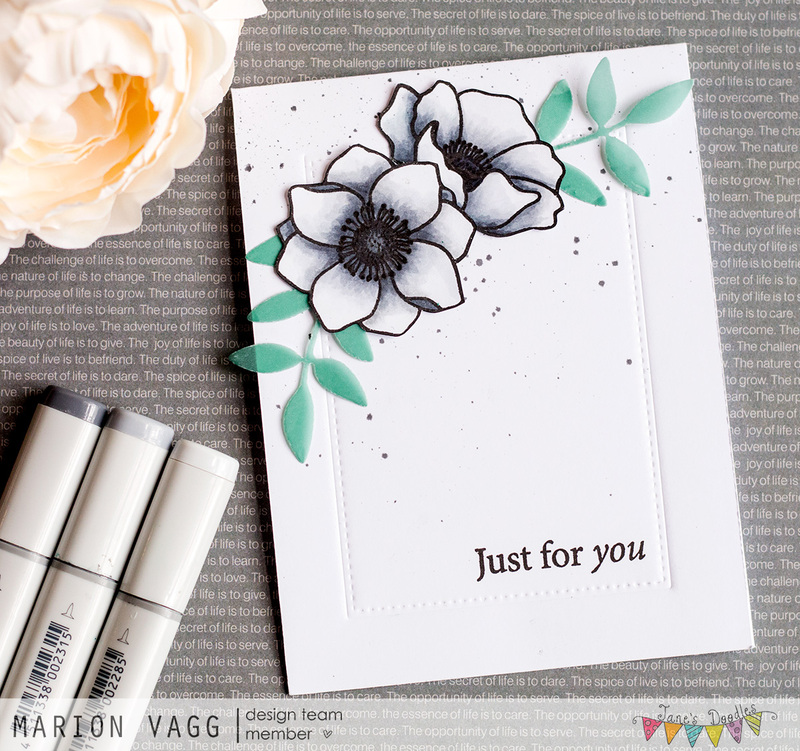 The flowers are from the Anemone stamp set and the sentiment is from the Doodle Flowers set. I coloured the flower with cool grey Copic marker tones then fussy cut the images. 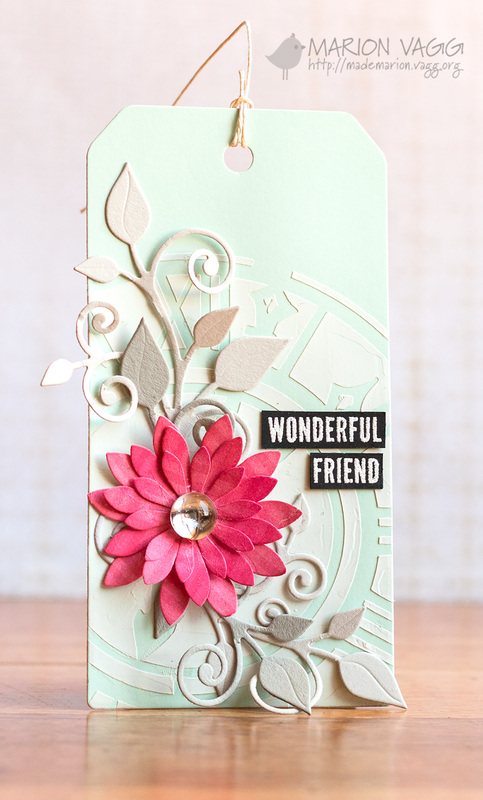 I embossed an MFT frame in the background using an embossing mat, then did some ink splatters to add interest. The leaves are a Penny Black creative die and are cut from some green vellum I discovered in my recent move! Thanks for stopping by today. I hope you are having a great week. 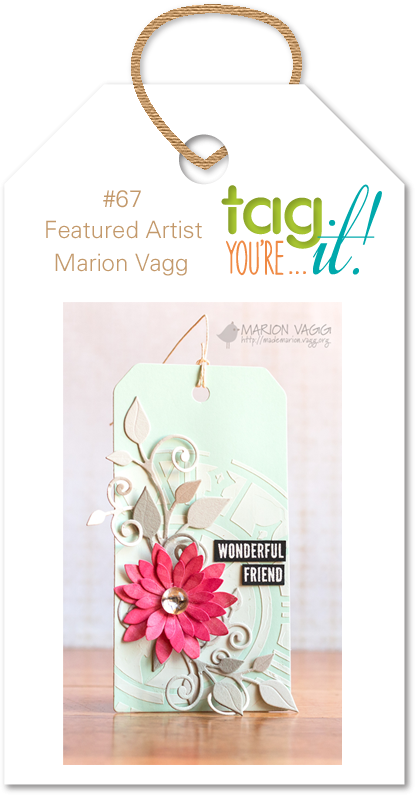 I am really honoured to be the Featured Artist over on the Tag You’re It challenge blog for their 67th challenge. A big thank you to Tracey McNeely for inviting me. If you follow my blog, you would know I am a huge fan of making tags and I also used to be on the Design Team for this challenge. So it is nice to be back as a Featured Artist! This tag is a little different to my usual style, but I was in the mood for some layers, texture and a more feminine creation. I used some texture paste and a Kaisercraft stencil to add texture to the background. 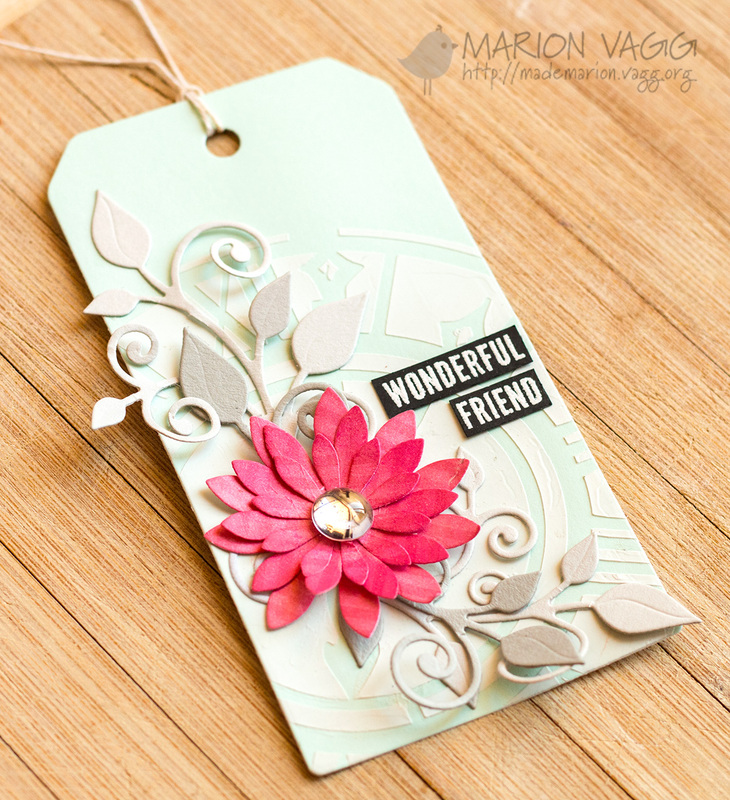 The flower is a Die-Namics die called Upsy Daisies and the sentiment is from a MFT set called Label Maker Sentiments. The leaves die is a Fancy That die called Leafy Swirl. I can’t wait to see how my tag inspires you. I hope you get a chance to play along. Head to the TYI blog for all the details. Thanks for stopping by. I’ll be back real soon. I have a couple of Jane’s Doodles projects to share with you today. You can find the original posts on the Jane’s Doodles blog here and here. First up is a little tag which uses the Cake! stamp set and it was super quick to make. I’ve actually had the splattered background sitting on my desk for a while, but it was pretty easy to create – a touch of Distress ink watercolouring and some splatters. 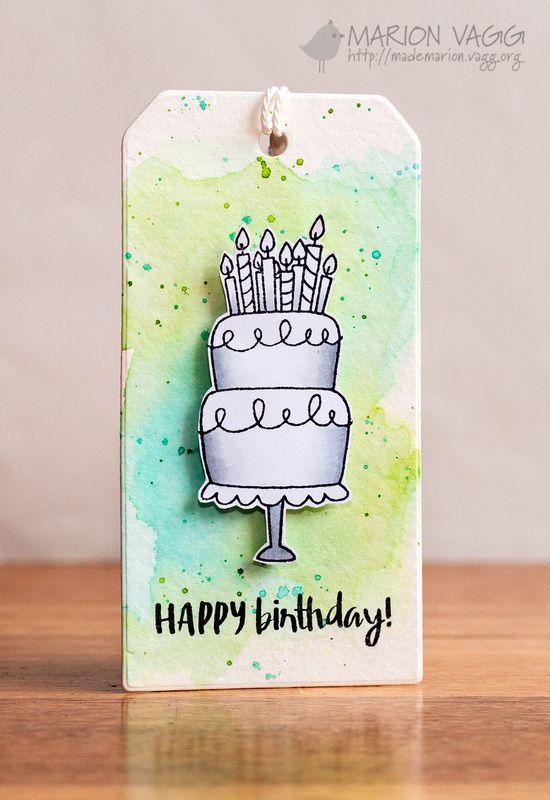 I stamped the cake image and didn’t want it to compete with the background, so I kept it fairly plain and just added some shading with some light grey Copic markers. It’s got some shimmer with some Wink of Stella, but it is hard to see in the photo. 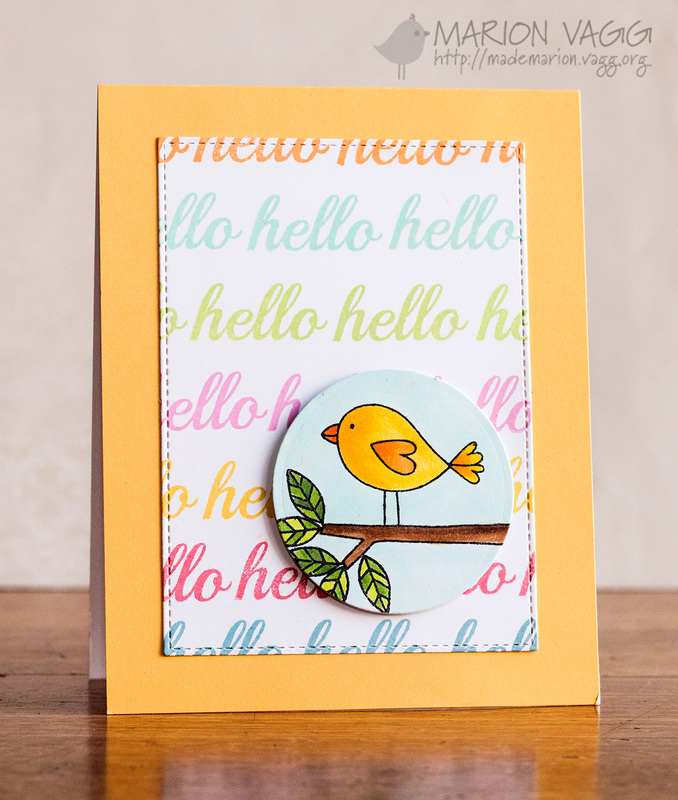 Next up is a happy hello card which features the Love Birds and Daisies stamp set. I stamped the hello sentiment repeatedly in different colours but I drew in some lines to help me get things straight. Once again, the little bird shimmers with a Wink of Stella. Boy I love that pen!